Summer may not technically start until June 21, but we all know Memorial Day is the real kickoff to the season of sun. Warmer temps mean time outside with family and friends, and what better way to celebrate than with the perfect Memorial Day party? Part patriotism, part summer fun, these ideas will help you throw the perfect bash to kick off summer. Mix Up the Menu - Most people expect a cookout on Memorial Day, but you can throw some extra fun items on the grill. Try adding corn on the cob and kabobs (get the kids to help you stack them with a mix of vegetables and proteins) in addition to the more obvious hamburgers, hot dogs and chicken. Enlist Help from Your Invitees - Memorial Day is one of those holidays where guests practically expect to be asked to bring something. 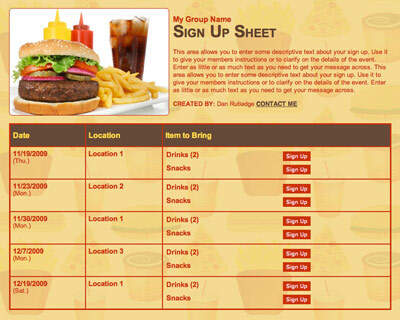 Let SignUpGenius help you with a sign up to ensure you get just enough hot dog buns and not too many cases of soda. Good Things Come in Small Packages - Host a slider party. The burgers are much smaller but can leave guests more options for topping them off. Add everything from relish and bacon to sautéed mushrooms and gourmet cheeses. Try a “BYOP” party - If this is a last-minute shindig, ask guests to bring whatever “protein” they want to throw on the grill, and then the host handles the grilling. Make a Signature Lemonade - It’s not summer until you’ve had your first sip of lemonade, and there are a surprisingly vast number of ways to make this summer staple. Start with the traditional recipe (or buy a premixed kind) and add two tablespoons of mango puree for a tropical twist or some fresh herbs like mint to elevate this drink. Pour a Cold One - Up the ante on this all-American holiday by getting craft beers from as many different states as possible. Fry It Up - Fried chicken is a fun staple for a backyard picnic. If it’s too time-consuming to cook, make it simple and pick up a bucket of chicken from the grocery store or your favorite fast food chain. It’s OK — it’s a holiday weekend! Serve Watermelon in Chunks - Forego slices. Cut watermelon into square chunks and offer guests toothpicks as a way to eat this summer fruit. It’s much neater than eating a slice. Leave watermelon juice sliding down chins to the kids at the party! As American as Apple Pie - It’s pretty much a given that you have to serve apple pie, but why not shake things up a bit? You can still serve the traditional pie, but make some single-portioned fried apple pies as well. Don’t forget to have some vanilla ice cream on hand to make it à la mode. Make a Simple, Patriotic Dessert - Bake a vanilla cake, frost with white icing and top with strawberries and blueberries in an American flag pattern. Get Creative with a Picnic Staple - Deviled eggs are sure to delight, so surprise partygoers by using some red and blue food coloring on your eggs for a patriotic look. Make a Jell-O Patriotic Dessert - Surprise your guests with a fun red, white and blue dessert made almost entirely of Jell-O. Prepare “berry blue” Jell-O as directed on the box. Pour into a 13X9 baking dish and refrigerate for an hour. Prepare lemon flavored gelatin using a cup of boiling water, then add one package of cream cheese and beat the two together. Let cool and then add 8 ounces of cool whip to the mixture. Add this on top of the berry blue Jell-O in the fridge. Next make raspberry Jell-O, according to box directions. Allow to cool, then pour this over the other two layers. Return to the fridge and chill — then serve! Roast S’mores - Close the night out with some fun around the fire pit. Everybody loves a roasted marshmallow and some chocolate in between graham crackers. Make Chocolate Strawberries - Dip red strawberries into white and blue chocolate (for blue, mix white with blue food coloring). Guests will be clamoring for more! Paint Lawn Stars - The grass grows quickly in summer, which is perfect for this idea! Create a large cardboard cutout of a star and spray paint in red, white and blue. You’ll be left with red, white and blue stars on your lawn. Make It a Luau - Nothing says summer like a party where people are wearing grass skirts, Hawaiian leis and colorful clothing. Use real pineapples as centerpieces and (fake) palm trees for decorating around the house or yard. Hang a Mix of Streamers - Red, white and blue, of course! Add twinkling lights inside and out to really help your party sparkle. Create a Tablescape - Place a white tablecloth on the table. Weave red and blue streamers together over top for a patriotic look. Add Colorful Balloons - You can opt for bunches of red, white and blue or go with one color. Just remember a big bunch of balloons makes a bigger impact than random single balloons floating around. Another idea is to affix balloons to your garage door to look like the American flag. Decorate with Small Flags - Place these patriotic reminders by each of your side dishes to give your table a festive look. Use Brightly Colored Beach Towels - Swap these for traditional tablecloths to help guests get in the summer mindset. Get Creative with Glass Jars - Find red, clear and blue glass or Mason jars. Fill them with white daisies or red roses for a cheerful and patriotic centerpiece. Warning: Bright Summer Ahead - Buy fun (and cheap!) sunglasses and give them to each of your guests as a fun gift to take home at the end of the night. As a bonus, you can use these as decorations throughout the party beforehand. Buy Tiki Torches - These not only help keep the mosquitoes away at dusk, but they’ll add a cool vibe to your party — whether it’s a luau, pool party or simple backyard barbecue. Make a Summer Playlist - Include songs like “Summertime” from Will Smith, “Good Vibrations” from The Beach Boys and “Cruel Summer” from Bananarama. Have a Moment of Silence - At its core, Memorial Day is about honoring those who died while serving in the U.S. armed service. Have a moment of silence before your meal and share stories of any loved ones who have served. Attend or Plan a Parade - Invite friends and family to attend a community Memorial Day parade before any party and pass out small flags to hold as a respectful tribute. You could also plan a parade for your neighborhood and ask participants to dress in their best red, white and blue. Give prizes to the most patriotic kid, family, wagon/bike and more. Serve Together - This can also be a good opportunity for family and friends to participate in a service activity. See if the local homeless shelter needs donated desserts or will let you help serve a meal. Check with the animal shelter to see if they could use help washing or walking the dogs. You can also work as a family to come up with a sweet treat to deliver to area police officers and firefighters. They’ll be at work — even on the holiday. Genius Tip: Need more ideas? Try these 50 community service ideas. Make Cards for Troops - Honor those still serving in the armed forces by asking partygoers to draw/write cards or compile care packages for the troops. Host a “Flag” Hunt - Instead of an Easter egg hunt, strategically place/hide small American flags throughout the house or yard, and the participant who finds the most flags gets a prize. Hold an American Trivia Competition - Just how much do your guests know about wars America has fought in? You can hold a trivia competition Jeopardy-style — the fastest wins — or have participants write down their answers. No peeking on phones! Have a Water Balloon Toss - This traditional game never gets old, especially when you’re kicking off the summer season. Have the kids help you fill the balloons (red, white and blue, of course). Divide into teams and toss away. The bigger the balloons, the better! Genius Tip: Try these 20 outdoor games for your backyard party. Play Old School Pool Games - If you’re hosting a pool party, help the kids zap some energy with some relay races, coin toss and Marco Polo. Genius Tip: Use these pool party planning ideas for more inspiration. Marking Memorial Day is the perfect way to kick off the season. 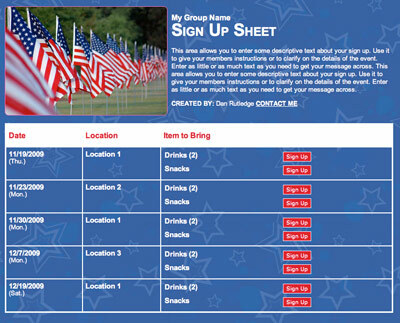 Add a dash of summer and a whole lot of patriotism, and you’ll be on your way to a great party! 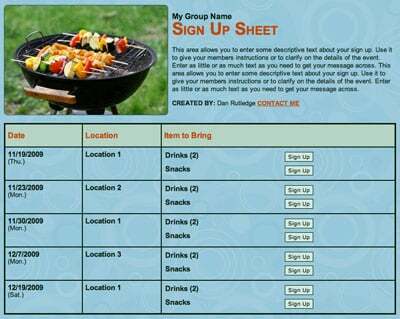 Plan a neighborhood potluck with an online sign up!